Thank you so much for your interest in Kitchen Table Jewelry! This information on tools and materials will make it easy for you to get ready and make the most of the class. Note the only tools required for the first class are those described under PRIMARY TOOLS below. Please get in touch if you have any questions. I'm looking forward to meeting you and seeing what you'll create! Hardwick's (4214 Roosevelt Way NE) is a great source for a huge range of lower-priced and used tools, as well as some jewelry tools (eg bench pins, needle files). Sometimes I will buy a cheap version of a tool there to try it out, then upgrade later. The store can be a little frantic, but be patient, and when someone waits on you show them this list. Seattle Findings (500 Union Street, #310) is more expensive but has tools and supplies specifically for making jewelry. Other local sources for tools and materials include Jo-Ann, Alexander's Bead Bazaar (6307 Roosevelt Way NE) and Fusion Beads (3830 Stone Way N). Rio Grande (www.riogrande.com) sells almost everything you can think of, including tools and precious metals. If you plan to buy sterling from them, see if someone else in the class would like to combine orders with you--you'll save on shipping and get a price break if your order goes over a certain amount. And of course, online sources such as eBay and Etsy can be useful if you have the time to hunt. Finally, your friends and neighbors can be a great source of used tools; many people have taken one or two jewelry classes but didn't pursue it any further (just what we're trying to avoid in this class!). These are the absolutely essential tools that you should bring to the first class: pliers, bench pin, and a jewelers' sawframe. size: Pick pliers that fit comfortably in your hands. springs: Some pliers are "spring-loaded"; a tiny spring automatically reopens the tool after you squeeze it closed. Not really necessary unless you anticipate getting into making chains or chainmail. shape: The business end of pliers can come in about 1000 different shapes. For beginning jewelry, get at least one pair of needle-nosed round jaw (each side has a round cross-section and tapers to a point) and one pair of slim flat jaw (where the sides meet is flat and about 1/4"-3/8" wide). 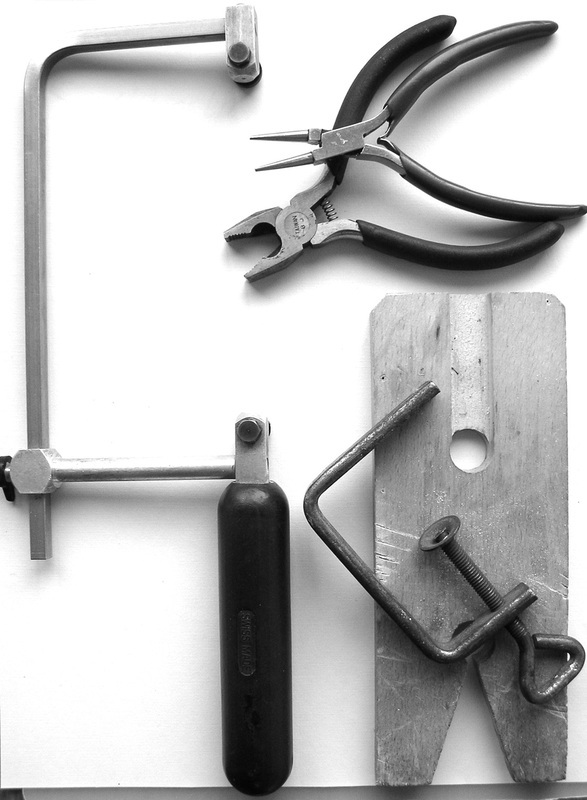 polish: Check that pliers are smooth, without pits, rough spots, or rust. hinges: Look at a pair of pliers from the side: the hinge will either be made up of two parts (a lap joint) or three parts (a box joint). Lapped pliers are usually cheaper but less durable; if you anticipate wanting to continue with jewelry, consider investing in pliers with a box joint hinge. This is your portable work surface, a small flat piece of wood with notches cut out of it. Buy one that comes with a metal clamp that allows you to attach it to a desk or table. On more expensive models the clamp has a large polished metal top that you can use as a surface for hammering on. depth: This is the measure of space between the blade and the back of the frame. A good basic is 3" or 4". adjustability: Some frames are fixed and cannot change height. An adjustable frame has an extra screw in the frame that lets you make it shorter or taller. If you can afford this, I'd recommend it, since I've found that saw blades are not always the same length. hardware: Cheaper frames have less precise and less ergonomic screws. Again, if you think you might use your saw a lot, think about an upgrade. handle: Some saws have wooden handles, others have plastic or rubber; this is a matter of personal preference more than function.